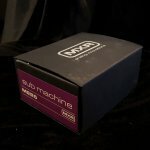 Unleash waves of frothy, shaggy fuzz tone with the MXR SubMachine guitar effects pedal. It's the perfect combination of the La Machine Fuzz with MXR's tried-and-true sub octave circuit - just what you need for absurdly heavy tone. Dial in the ideal fuzz and even kick in an octave up when the mood strikes you via a dedicated footswitch. The actual Octave control puts the sub in SubMachine, allowing you to roll on as much sub-octave thickness as you like. What's more, the SubMachine includes a Series switch, which lets you run the sub octave either through the fuzz effect or keep it clean by running it parallel. If you dig the Blue Box the way many of us at Sweetwater do, then you're going to love the SubMachine.